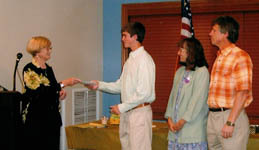 The Forest Park Women’s Club has been giving scholarships to local high school seniors for the past 41years. To date, we have donated approximately $78,000 towards some college dreams. In order to do this, the club has several fundraisers throughout the year and also hosts a Craft Show and Bazaar the last Saturday in October at the Winton Woods High School. Raffle tickets, lunch and a club sponsored bake sale are also some of the fundraising efforts put on by the club towards the scholarships. We are proud to do our small part in the future of area students. Applications for scholarships are accepted in April and decided on in May. Please click on the link below to see the rules for the FPWC’s Scholarship Program.